Maybe you know we can't play camcorder MOD files on Mac OS X with QuickTime or iTunes. We can't play MOD files in Windows Media Player, VideoLAN VLC media player, Roxio Toast, etc. There are most popular digital camcorders such as Panasonic SV AV100, Canon MOD Camcorders, JVC and Panasonic record videos as MOD formats. Now Mac MOD to AVI Converter can solve the problem. Note: If you are a Windows user and want to convert MOD to AVI, please refer to Video Converter for Windows. Operating Mac MOD to AVI converter and add MOD files to the program. 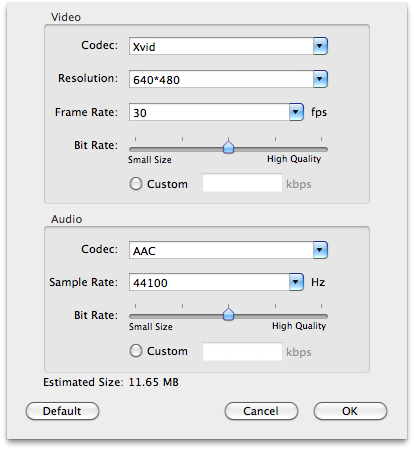 Tips: Mac MOD to AVI Converter can convert other video formats to AVI, so you can add other videos convert to AVI. Select ".avi" as output formats and choose destination folder. Tips: With Mac MOD to AVI convert you can not only convert MOD to AVI but also can convert MOD to other video formats. You just choose the output formats you want. Click the Convert button to start converting MOD to AVI on Mac, and then you will find AVI files in your destination folder.